Move over kale and coconut water – there are some new food trends ready to take centre stage this year. You may have seen this in your local health food shop or supermarket and wondered what it is. Kombucha tea is a fermented tea made by brewing black sweetened tea and adding bacteria and yeast to it. This mixture is left to ferment for 7-10 days before it’s ready. The resulting drink is slightly fizzy and has a vinegary-sweet flavour. 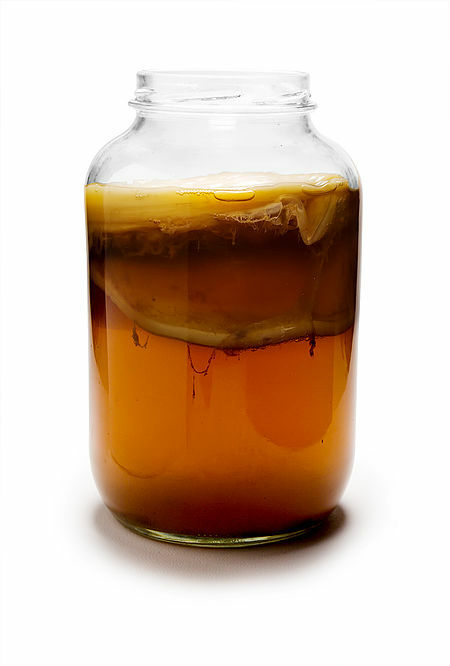 Kombucha originated in Asia, where it has been drunk for centuries. Nutritionally, the tea contains some antioxidants and B vitamins (good for energy). Like all fermented products, it may help maintain a healthy balance of gut flora. It’s low in sugar too. There are many claims about the health benefits of drinking Kombucha tea, but as yet there are no solid scientific studies supporting these claims. It’s claimed to cure conditions including baldness, insomnia, arthritis, gastrointestinal problems, chronic fatigue syndrome, and even AIDS and cancer. There are unsubstantiated claims that Kombucha tea can boost the immune system and reverse the ageing process. However, there is currently no scientific evidence available that supports any of these claims. In fact, some studies into the effects of Kombucha tea show negative side effects (including death! ), possibly due to food safety issues. Also, it’s quite costly to buy. I didn’t mind the taste of Kombucha tea. It had a vinegary taste and was quite tart, with a slight fizziness to it. It’s unlike any drink I’ve tried before so it’s hard to compare it. I tried a homemade version, so perhaps the commercial versions have been sweetened or flavoured to make them more palatable. I wouldn’t necessarily rush out to buy a bottle to drink, but if it was offered to me, I’d have it again. I always enjoy trying new things and I was pleasantly surprised with the taste of this tea, given it didn’t sound too appealing when I was researching this article! I wouldn’t recommend it to improve health or to cure any health conditions, but if you were looking to try something different, a bottle of this is a less sweet alternative to juices or soft drinks.